There are a few review articles ,, that have surveyed the effect of N. sativa on some diseases. In these research projects, the role of this plant as a treatment factor is evaluated but only a section of parameters was investigated, such as lipid profile in diabetes,  BP,  or antioxidant activity. Therefore, we are going to review the effect of N. sativa supplementation on different clinical and biochemical parameters in humans, the majority of which exist in metabolic syndrome. The protocol that was used in this study is the Preferred Reporting Items for Systematic Reviews and Meta-Analyses (PRISMA) checklist. A search of published studies was performed by using computer databases including PubMed, Google Scholar, Thomas Reuters Web of Science, and Cochrane. Searching was done for articles in the English language until June 2014. Medical subject headings (MeSH) terms included: ("Nigella sativa" [MeSH] OR "blackseed" [tiab] OR "blackcumin" [tiab] OR "Kalonji" [tiab]) AND "Triglycerides" [MeSH] OR "Cholesterol" [Mesh] OR "Lipoproteins, LDL" [MeSH] OR "Lipoproteins, HDL" [MeSH] OR "Blood glucose" [MeSH] OR "Hemoglobin A, Glycosylated" [MeSH] OR "Blood pressure" [MeSH] OR "Body mass index" [MeSH] OR "Waist circumference" [MeSH]). The effect of N. sativa on clinical or biochemical parameters. The effect of N. sativa on unrelated blood or clinical parameters. The effect of N. sativa in combination with other plants or exercise. The following data were extracted: Author, country of study, date of publication, study design, duration of study, aims, number and age of persons, dose of supplement, score of study, and effects of intervention. 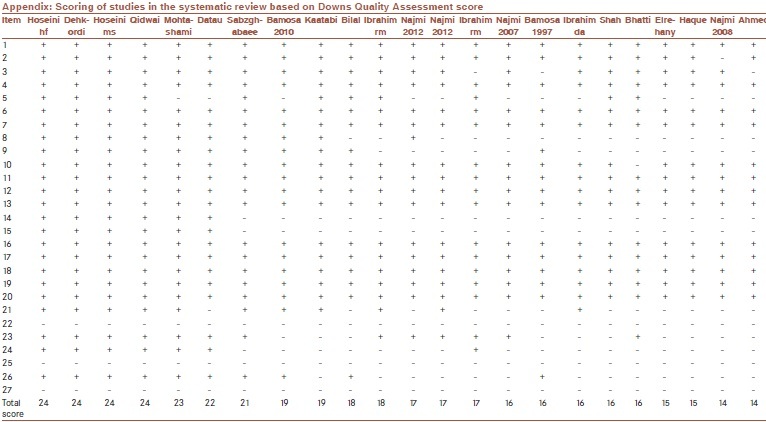 In scoring studies, the trials were stratified based on a scoring checklist as Down Quality Assessment scores. Trials were stratified in this checklist based on acquired scores [Appendix [Additional file 1]]. Initially, 515 articles were extracted. After reviewing their titles and abstracts and removing unrelated, animal, and review studies, 28 articles were retrieved for further evaluation. Finally, 23 studies were considered eligible for our review [Table 1]. The eligible articles were published until June 2014. Five articles could not be included in this review as 3 of them evaluated the effect of N. sativa in combination with other plants or exercise. The other 2 were duplicated. With regard to the form of supplement, 2 studies , have used extract of N. sativa, 8 articles ,,,,,,, used oil from the seed, and in the others, that is, 13 articles, powder of N. sativa was provided for subjects. The total number of subjects in the trials was 1531. The duration of the trials was between 2 weeks and 6 months. The dose of N. sativa supplements was between 200 mg and 5 g per day and was administered orally in all studies. The age range of the participants in trials was 18-65 years old. With regard to the quality of the research based on Down Quality Assessment scores,  5 studies ,,,, showed double blinding of intervention and 13 trials ,,,,,,,,,,,, demonstrated appropriate randomization, but in the other studies randomization or blinding was unclear. 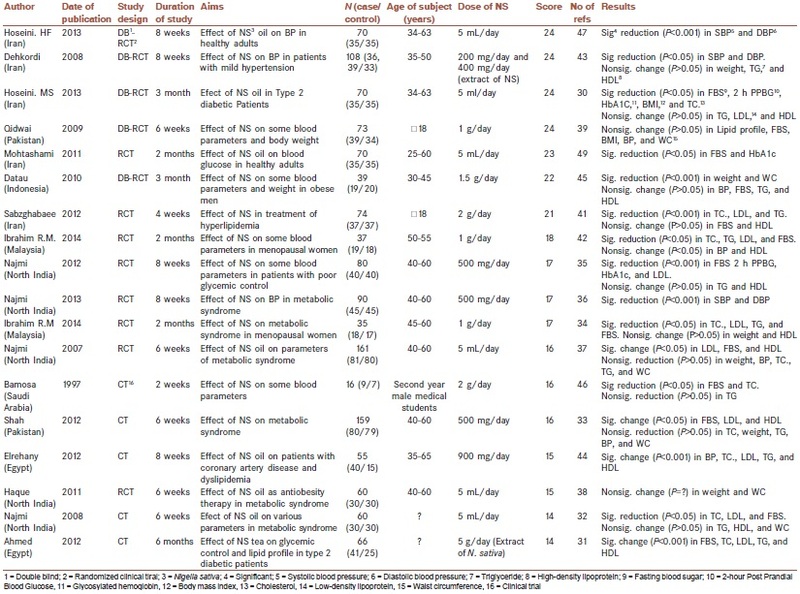 The characteristics of 18 included clinical trials are shown in [Table 2]. Five articles ,,,, had no control group and were quasi-experimental studies [Table 3]. In 9 studies, ,,,,,,,, there were similar baseline characteristics between groups. Eight trials ,,,,,,, reported the rate of dropouts, but in all of them the rate was more than 10%, as in 1 article  it was 42%, which naturally affected the results of the study. In 6 studies, ,,,,, sample sizes were 10-41 and in the others were 55-161 subjects. This parameter reveals the condition of the blood glucose level from several weeks ago (6-8 weeks) and is a part of the glucose in serum that is combined with hemoglobin. In normal circumstances this parameter should be <6%. In all of the trials that evaluated this factor, ,,, N. sativa could reduce the level of this factor significantly. This reduction was accompanied by the lowering of the FBS level. Overweight and obesity, especially central obesity, is associated with metabolic disturbances such as diabetes and dyslipidemia. Only in 2 studies, , did a few participants who received N. sativa oil at the dose of 5 mL per day experience mild nausea, at the beginning of study, and the nausea disappeared at the second week of intervention. In the other 8 trials, no notable liver or kidney side effects were observed. This was evidenced by laboratory tests done for liver and kidney functions. Other articles (13 trials) did not detect any adverse effects of this plant. In this systematic review we have tried to evaluate the effects of N. sativa supplementation on lipid profiles, glycemic factors, BP, and some of anthropometric indices (weight, BMI, and WC), of which a few are parameters of metabolic syndrome. In many studies N. sativa could effectively change parameters in different patients and subjects, but in several trials these changes were not significant [refer to [Table 2]]. Lipid profiles constitute one of the most important factors that can be changed in many diseases and are used to evaluate conditions of the patients and subjects. In our review, changes in lipid profiles were different as in many trials N. sativa supplement could change these parameters significantly, but in some studies it could not. However, in 4 articles ,,, all of parameters (TG, TC, LDL, and HDL) were affected significantly by N. sativa. In 1 trial  any reason was reported but it was speculated that small sample size and low dose of supplement were effective. Presence of oleic acid that regulates lipid structure in membrane and control G-protein. Calcium channel-blocking activity by N. sativa. The most important limitation in our systematic review was difficulty in finding the full texts of many published papers. Further, we included only English-language articles and clinical trials in this review and not other studies. This systematic review on 23 studies demonstrated that N. sativa supplement in different doses and durations can change various clinical and biochemical parameters, including lipid profiles, glycemic factors, BP, and some anthropometric indices in humans. However, the effect of this supplement is more pronounced on levels of TC, LDL, FBS, and HbA1c than on TG, HDL, BP, weight, and WC. Therefore, it is suggested that consumption of N. sativa supplementation be considered as a complementary treatment protocol for many diseases, especially metabolic disorders. We appreciate the School of Nutrition & Food Science, Isfahan University of Medical Sciences, Iran for their co working in this study. AM contributed in the preparation of the work and conducting the study and MHE (as Corresponding author) contributed in the revising of the draft and approval of the final version of manuscript. Sayed M. Traditional medicine in health care. J Ethnopharmacol 1980;2:19-22. Shrivastava RM, Agrawal RC, Parveen ZJ. A review on therapeutic applications of Nigella sativa. J Chem Chem Sci 2011;1:241-8. Ali K, Hasanah M, Ghazali A, Yassoralipour Y, Ali G. Physicochemical characteristics of nigella seed (Nigella sativa L.) oil as affected by different extraction methods. J Am Oil Chem Soc 2011;88:533-40.
al-Awadi F, Fatania H, Shamte U. The effect of a plants mixture extract on live gluconeogenesis in streptozosin induced diabetic rats. Diabetes Res 1991;18:163-8. Gilani AH, Shaheen F, Shakir T. Thymol lowers blood pressure through blockade of calcium channels. Fundam Clin Pharmacol 2001;15:8P163. Al-Ghamdi MS. The anti-inflammatory, analgesic and antipyretic activity of Nigella sativa. J Ethnopharmacol 2001;76:45-8. Parhizkar S, Latif LA, Rahman SA, Dollah MA. Preventive effect of Nigella sativa on metabolic syndrome in menopause induced rats. J Med Plants Res 2011;5:1478-84. Salama RH. Hypoglycemic effect of lipoic acid, carnitine and Nigella Sativa on diabetic rat model. Int J Health Sci (Qassim) 2011;5:126-34. Khattab MM, Nagi MN. Thymoquinone supplementation attenuates hypertension and renal damage in nitric oxide deficient hypertensive rats. Phyto ther Res 2007;21:410-4. Zaoui A, Cherrah Y, Lacaille-Dubois MA, Settat A, Amarouch H, Hassar M. Diuretic and hypotensive effects of Nigella sativa in the spontaneously hypertensive rat. Therapie 2000;55:379-82. Tsimidou M, Papadopoulos G, Boskou B. Determination of phenolic compounds in virgin olive oil by reversed-phase HPLC with emphasis on UV detection. Food Chem 1992;44:53-60. Mahfouz M, El-Dakhakhny M. Some chemical and pharmacological properties of the new anti-asthmatic drug, Nigellone. Egypt Pharm Bull 1960;42:411-24. Toppozada HH, Mazloum HA, el-Dakhakhny M. The antibacterial properties of the Nigella sativa l. Seeds. Active principle with some clinical applications. J Egypt Med Assoc 1965;48(Suppl):187-202. Kanter M, Meral I, Yener Z, Ozbek H, Demir H. Partial regeneration/proliferation of the beta cells in the islets of Langerhans by Nigella sativa L. in streptozotocin-induced diabetic rats. Tohoku J Exp Med 2003;201:213-9. Khanam M. Dewan F. Effects of the crude and the n-hexane extract of Nigella sativa Linn (kalajira) upon diabetic rats. Bangla J Pharmacol 2008;4:17-20.
el-Dakhakhny M, Mady NI, Halim MA. Nigella sativa L. Oil protects against induced hepatotoxicity and improves serum lipid profile in rats. Arzneimittelforschung 2000;50:832-6. Qidwai W, Ashfaq T. Effect of dietary supplementation of black seed (N. Sativa L.) on lipid profile of patients suffering from diabetes. Antiinflamm Antiallergy Agents Med Chem 2014; 13:3-8. Leong XF, Rais Mustafa M, Jaarin K. Nigella sativa and its protective role in oxidative stress and hypertension. Evid Based Complement Alternat Med 2013;2013:120732. Bilal A, Masud T, Uppal AM, Naveed AK. Effects of Nigella sativa oil on some blood parameters in Type 2 diabetes mellitus patients. Asian J of Chemistry 2009;21:5373-81. Kaatabi H, Bamosa AO, Lebda FM, Al Elq AH, Al-Sultan AI. Favorable impact of Nigella sativa seeds on lipid profile in type 2 diabetic patients. J Family Community Med 2012;19:155-61. Hoseini MS, Mirkarimi SA, Amini M, Mohtashami R, Kianbakht S, Fallah Hoseini H. Effects of Nigella sativa L. seed oil in type II diabetic Patients: A randomized, double-blind, placebo-controlled clinical trial. J Med Plants 2013;12:93-9. Ahmed MM, El-Shamy KA, El-Nabarawy SK, Elbaiomy MA, El-Qattan GM. Nigella sativa tea improved serum paraoxonase-1 activity, glycemic control and lipid profile in type 2 diabetes mellitus. J Appl Sci Res 2012;8:5897-902. Najmi A, Nsiruddin M, Khan RA, Haque SF. Effect of Nigella sativa oil on various clinical and biochemical parameters of insulin resistance syndrome. Int J Diabetes Dev Ctries 2008;28:11-4. Shah AS, Khan GM, Badshah A, Shah SU, Shah KU, Mirza SA, et al. Nigella sativa provides protection against metabolic syndrome. Afr J Biotechnol 2012;11:10919-25. Ibrahim RM, Hmdan NS, Ismail M, Saini SM, Abd Rashid SN, Abd Ltiff L, et al. Protective effects of Nigella sativa on metabolic syndrome in menopausal women. Adv Pharm Bull 2014;4:29-33. Najmi A, Nsiruddin M, Khan RA, Haque SF. Therapeutic effect of Nigella sativa in patients of poor glycemic control. Asian J Pharm Clin Res 2012;5:224-8. Najmi A, Nsiruddin M, Khan RA, Haque SF. Indigenous herbal product Nigella sativa proved effective as an antihypertensive in metabolic syndrome. Asian J Pharm Clin Res 2013;6:6-4. Najmi A, Haque S, Khan R, Nasiruddin M. Therapeutic effect of Nigella Sativa oil on different clinical and biochemical parameters in metabolic syndrome. The Int J of pharm 2007;5:13. Haque SH, Nasiruddin M, Najmi A. Indigenous herbal product Nigella sativa proved effective as an anti-obesity therapy in metabolic syndrome. Int J Med Res 2011;1:173-6. Bhatti IU, Rehman FU, Khan MA, Marwat SK. Effect of prophetic medicine kalonji (Nigella sativa l) on lipid profile of human beings: An in vivo approach. World Appl Sci J 2009;6:1053-7. Sabzghabaee AM, Dianatkhah M, Sarrafzadegan N, Asgary S, Ghannadi A. Clinical Evaluation of Nigella Sativa seeds for the treatment of hyperlipidemia: A randomized, placebo controlled clinical trial. Med Arch 2012;66:198-200. Ibrahim RM, Hamdan NS, Mahmud R, Imam MU, Saini SM, Rashid SN, et al. A randomised controlled trial on hypolipidemic effects of Nigella Sativa seeds powder in menopausal women. J Transl Med 2014;12:82. Elrehany M, Elbawb Elsaid ME, Younis HA, Mhmoud AM. Therapeutic effect of Nigella sativa on patients with coronary artery disease. AAMJ 2012;10:12-25. Bamosa AO, Basil A, Sowayan AA, Sowayan SA. Effect of oral ingestion of Nigella sativa seeds on some blood parameters. Saudi Pharma J 2007;2:126-9. Fallah Huseini H, Amini M, Mohtashami R, Ghamarchehre ME, Sadeqhi Z, Kianbakht S, et al. Blood pressure lowering effect of Nigella sativa L. seed oil in healthy volunteers: A randomized, double-blind, placebo-controlled clinical trial. Phytother Res 2013;27:1849-53. Ibrahim DA. Comparative study between plant and animal sources of omega-3 fatty acid in their potential role of regulating blood glucose and lipid Profile in Healthy Volunteers. Yemeni J Med Sci 2011;5:7-14. Mohtashami R, Amini M, Fallah Huseini H, Ghamarchehre M, Sadeqhi Z, Hajiagaee R, et al. Blood glucose lowering effects of Nigella Sativa L. seeds oil in healthy volunteers: A randomized, double-blind, placebo-controlled clinical trial. J Med Plants 2011;10:90-4. Datau EA, Wardhana, Surachmanto EE, Pandelaki K, Langi JA, Fias. Efficacy of Nigella Sativa on serum free testosterone and metabolic disturbances in central obese male. Acta Med Indones 2010;42:130-4. Padhye S, Banerjee S, Ahmad A, Mohammad R, Sarkar FH. From here to eternity-the secret of pharaohs: Therapeutic potential of black cumin seeds and beyond. Cancer Ther 2008;6:495-510.
de Jong A, Plat J, Mensink RP. Metabolic effects of plant sterols and stanols (Review). J Nutr Biochem 2003;14:362-9. Ismail M, Al-Naqeep G, Chan KW. Nigella sativa thymoquinonerich fraction greatly improves plasma antioxidant capacity and expression of antioxidant genes in hypercholesterolemic rats. Free Radic Biol Med 2010;48:664-72. Ibraheim Z. Effect of Nigella sativa seeds and total oil on some blood parameters in female volunteers. Saudi Pharm J 2002;10:54-9. Morikawa T, Xu F, Ninomiya K, Matsuda H, Yoshikawa M. Nigellamines A3, A4, A5, and C, new dolabellane-type diterpene alkaloids, with lipid metabolism-promoting activities from the Egyptian medicinal food black cumin. Chem Pharm Bull (Tokyo) 2004;52:494-7. Al-Naqeep G, Ismail M. Effects of thymoquinone rich fraction and thymoquinone on plasma lipoprotein level and hepatic low-density lipoprotein receptor and 3-hydroxy-3-methylglutaryl coenzyme a Reductase gene expression. J Funct Foods 2009;1:298-303. Alsaif MA. Effect of N. Sativa oil on Impaired glucose tolerance and insulin insensitivity induced by high-fat-diet and turpentine-induced trauma. Pak J Biol Sci 2008;11:1093-9. Abdelmeguid NE, Fakhoury R, Kamal SM, Al Wafai RJ. Effects of Nigella sativa and hymoquinone on biochemical and subcellular changes in pancreatic β-cells of streptozotocin induced diabetic rats. J Diabetes 2010;2:256-66. Geng D, Zhang S, Lan J. Analysis on chemical components of volatile oil and determination of thymoquinone from seed of Nigella glandulifera. Zhongguo Zhong Yao Za Zhi 2009;34:2887-90. Fararh KM, Shimizu Y, Shiina T, Nikami H, Ghanem MM, Takewaki T. Thymoquinone reduces hepatic glucose production in diabetic hamsters. Res Vet Sci 2005;79:219-23. Andriambeloson E, Magnier C, Haan-Archipoff G, Lobstein A, Anton R, Beretz A, et al. Natural dietary polyphenolic compounds cause endothelium-dependent vasorelaxation in rat thoracic aorta. J Nutr 1998;128:2324-33.
el Ashry A, Heagerty AM, Ollerenshaw JD, Thurston H. The effect of dietary linoleic acid on blood pressure and erythrocyte sodium transport. J Hum Hypertens 1989;3:9-15. Terés S, Barceló-Coblijn G, Benet M, Alvarez R, Bressani R, Halver JE, et al. Oleic acid content is responsible for the reduction in blood pressure induced by olive oil. Proc Natl Acad Sci U S A 2008;105:13811-6. Bamosa AO, Ali BA, al-Hawsawi ZA. The effect of thymoquinone on blood lipids in rats. Indian J Physiol Pharmacol 2002;46:195-201. Actis-Goretta L, Ottaviani JI, Fraga CG. Inhibition of angiotensin converting enzyme activity by flavanol-rich foods. J Agric Food Chem 2006;11:229-34. Le PM, Benhaddou-Andaloussi A, Elimadi A, Settaf A, Cherrah Y, Haddad PS. The petroleum ether extracts of Nigella sativa seeds exert insulin sensitizing and lipid lowering action in rats. J Ethnopharmacol 2004;94:251-9. Akova A, Ustun G. Activity and adsorption of lipase from Nigella sativa seeds. Biotechnol Lett 2004;22:355-9.